View the recently rediscovered amphitheatre and ruins of Roman London. Explore the castles and history of mountainous Snowdonia in North Wales. Piece together storied histories, rivalries and landscapes to experience quintessential Britain -- from London to Bath, the villages of the Cotswolds to the dreaming spires of Oxford, the “bonnie banks” of Loch Lomond and the Scottish capital, Edinburgh. In each city and village, uncover the surrounding history, geography, culture, literature, houses and gardens, cathedrals and castles with local experts. Accommodation: Radisson Edwardian Vanderbilt Hotel. Morning: Transfers from airport to hotel. Lunch: In the hotel dining room for those arriving by lunchtime. A light lunch with coffee, tea and water. Other beverages are available for purchase. Afternoon: Arrivals continue, with free time for those who have already arrived. At 5pm we will have an Orientation in the hotel. The Group Leader will greet everyone and lead introductions. This program is staffed with both a Group Leader, who will accompany us throughout the program and deal primarily with logistics, and a Study Leader who will lecture, conduct field trips and serve as an information resource on program-related topics. We will review the program theme, the up-to-date Daily Schedule and any changes, discuss safety guidelines, emergency procedures, roles and responsibilities and answer any questions you may have. We have set aside some free time in the schedule for your personal independent exploration. Please note that program activities, schedules and personnel may need to change due to local circumstances. In the event of changes, we will alert you as quickly as possible. Thank you for your understanding. Dinner: A seated dinner will be taken in the hotel dining room with coffee, tea and water. Other beverages are available for purchase. Evening: Free time to unpack, relax and prepare for the program ahead. Breakfast: In the hotel dining room. A breakfast buffet with a range of hot and cold items, as well as coffee, tea, water and fruit juices. Morning: This morning’s field trip takes us by motor coach to the British Museum to explore world cultures, from Prehistory to the present day. Your Study Leader will offer a brief on-site introduction to the museum, followed by time to explore the wealth of exhibits and galleries on your own. We will then re-group for the British Galleries, Stonehenge and the Sutton Hoo collections, expertly guided by your Study Leader. Afternoon: The field trip continues this afternoon to the Guildhall and St. Paul’s Cathedral. The Guildhall was the administrative centre of London for over 800 years. St. Paul’s, Christopher Wren’s famous cathedral, was built to replace the earlier medieval building which was destroyed in the Great Fire of 1666. Evening: Free time. Your Group Leader will be happy to offer suggestions should you wish to further explore London. Morning: We travel by motor coach to the Tower of London, the City’s ancient defensive centre. Built at the behest of William the Conqueror in 1097, the White Tower still stands guard over the Thames. It is here that monarchs, importunate princes and lesser mortals were imprisoned and beheaded. Now the Tower is best known as the repository of the world famous Crown Jewels, including the Koh-I-Noor and Cullinan Diamonds – two of the world’s most famous diamonds and worn in the crown of Queen Victoria. The Crown Jewels were remade for Charles II after the originals were melted down in the Civil War and provide a spectacular insight into the power of the Royal Family throughout history. Lunch: On your own to enjoy what you like. Afternoon: This afternoon we will travel by boat along the Thames to Westminster, the centre of British Political power. Here we will see the exterior of the Houses of Parliament, and maybe even hear the chimes of “Big Ben”. We then continue on to an expert-led field trip inside Westminster Abbey before a flight on the London Eye, the Ferris Wheel built to celebrate the Millennium which affords spectacular views over the City. Dinner: A served dinner taken in a traditional English pub. Evening: Travel with your Study Leader by motor coach as he leads an exploration of London at night. Morning: Today’s full day field trip takes us by motor coach to Oxford, the City of Dreaming Spires. Enjoy an educational walk around the city with your Study Leader, and explore the prized collections of art and archaeology on display at the world famous Ashmolean Museum. Lunch: A served lunch taken out in Oxford. Afternoon: The field trip continues as a local expert reveals the grandeur of Henry VIII’s Christ Church. Founded in 1546 and one of the largest of the Oxford’s 38 colleges, Henry’s Lord Chancellor Thomas Wolsey planned the impressive Great Quadrangle, the Tudor Kitchen and the Great Hall. Christ Church is, uniquely, the Cathedral seat of Oxford and occupies a 150 acre site in the centre of the city. This includes the Meadow, a tranquil area of pasture bounded by the Rivers Isis and Cherwell. Breakfast: In hotel dining room. Morning: We bid farewell to London and depart by motor coach for the picturesque Cotswold village of Mickleton, visiting the iconic Stonehenge and the Roman spa city of Bath on the way. Stonehenge has a world class visitor centre, housing quality permanent exhibitions as well as the opportunity to walk close to the stones themselves and take in the immense sense of ancient history. Lunch: A packed lunch of sandwiches, fruit and a drink or similar will be provided to make the most of this busy transfer day. Afternoon: We continue on to Bath where we visit the well preserved Roman Baths and Pump Room. Around Britain’s only hot spring, the Roman’s built a magnificent temple and building complex that still flows with natural hot water and was regarded as the beating heart of Bath for centuries. Following the visit there will be an optional walk through Bath with your Study Leader, before we journey onwards to the village of Mickleton. On arrival, check in at the hotel and attend a Welcome Meeting with your Study Leader for the next leg of this program. Dinner: A served dinner with water, tea and coffee in the hotel dining room. Other beverages are available for purchase. Morning: This morning your Study Leader lectures on “The Cotswolds”, followed by a field trip by motor coach to the countryside and villages of the Cotswolds, starting with Broadway before moving on to Stow. Afternoon: Our field trip continues to the lovely market town of Chipping Campden, where we will spend the afternoon. Evening: A visit to the heart of many British towns and villages – the local pub! Morning: Your Study Leader will this morning lecture on “Shakespeare and Stratford” before we take a field trip by motor coach to Shakespeare’s home town, Stratford-Upon-Avon. Allow yourself to be immersed in this historic town on a fascinating educational walk. Afternoon: The field trip continues to Hidcote Gardens, a garden created in the Arts & Crafts style by Major Lawrence Johnston. It is arranged as a series of outdoor rooms, each with a different character and separated by walls and hedges of many different species. Morning: Today we transfer by motor coach to Chester, stopping on the way in the town of Ironbridge, one of the most important centres of the industrial revolution. We will also pay a visit to Blists Hill living museum, allowing us to travel back in time to the Victorian era. Afternoon: The transfer continues with a stop at Farndon Parish Church, extant since at least 1065. After check in at the hotel, we will have a welcome to Chester and a lecture concerning an “Introduction to Snowdonia”. Morning: Enjoy a lecture on the coach describing the National Parks of Wales as we absorb the beautiful scenery of Snowdonia National Park, before continuing on to the impressive medieval Conwy Castle. Lunch: A served lunch taken with coffee, tea and water taken at Anna’s Tea Room in Conwy. Afternoon: After lunch, visit the Welsh Slate Museum in Llanberis to learn about one of the important industries in Welsh history. 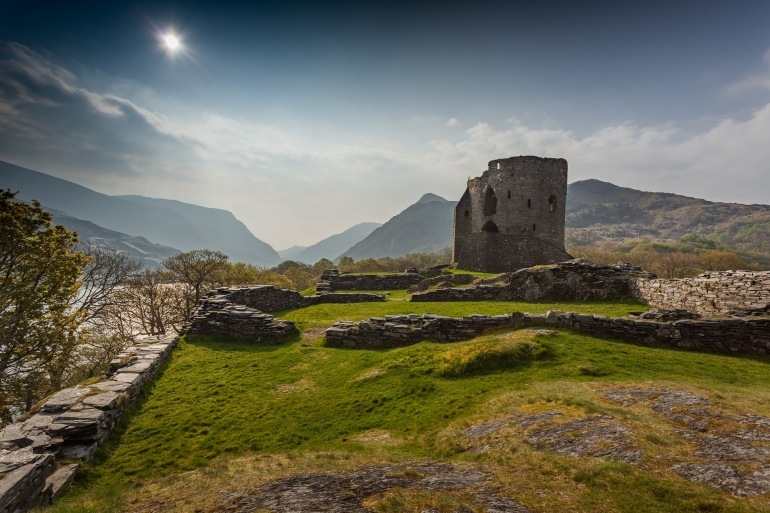 There will also be an optional short walk to the ruins of Dolbadarn Castle. Morning: This morning we have a walking field trip of Chester, including Chester Cathedral and an in-the-field lecture entitled “Chester and Cheshire”. Lunch: Lunch will be taken at Chester Cathedral. Afternoon: Free time to further explore Chester. Your Group Leader will be able to assist you should you wish to take advantage of local laundry facilities. Morning: Today we transfer by motor coach to the cathedral city of York. En route we will pay a visit to Haworth, home of the Bronte Sisters. Enjoy a lecture on the coach about this famous literary family before an excursion to the Parsonage, their lifelong home. Lunch: Served at the Old White Lion, Haworth – a 300 year old coaching inn. Afternoon: The transfer continues after lunch, with a lecture on York during the journey. On arrival at the hotel we will have a Welcome Meeting, followed by a lecture on Abbeys and Monasteries. Dinner: Served at the hotel. Breakfast: Full English breakfast in the hotel. Morning: This morning’s field trip takes us by motor coach to Castle Howard, built in 1699 and set in over 1,000 acres of parkland, lawns, woodland gardens, lakes, fountains and magnificent rose gardens. After enjoying the castle we will travel onwards to the small village of Rievaulx. Lunch: Lunch will be taken out in Rievaulx. Afternoon: After lunch, enjoy a field trip to the ruins of the 13th Century Rievaulx Abbey. Morning: This morning join a local expert for a walk around the historic city of York. Lunch: Enjoy a traditional English lunch of Fish & Chips in York. Afternoon: Free time. Explore this magnificent and ancient city, packed with history and culture. Perhaps visit York Minster Cathedral, the largest Gothic cathedral in Europe. Morning: Today we transfer by motor coach to Edinburgh via Chesters Roman Fort on Hadrian’s Wall. Lunch: Served at the George Hotel. Afternoon: The transfer continues with a lecture on the coach entitled “Border Wars”. On arrival in Edinburgh, check in at the hotel and hear a further lecture from your Study Leader on Scotland’s History. Dinner: Served in the hotel. Morning: This morning we take a walking field trip to the medieval Old Town of Edinburgh. Old Town is a labyrinth of cobbled streets, narrow alleyways and hidden courtyards, all amazingly well preserved and steeped in the city’s history. At its centre is the Royal Mile, a remarkable street of Reformation-era tenement buildings, leading from the sea of Edinburgh Castle down to the grandiose Palace of Holyroodhouse. Afternoon: Free time. You may wish to visit Edinburgh Castle or Holyrood House. Entrance to the Castle and Holyroodhouse will be at your own expense. Breakfast: Full Scottish breakfast in the hotel. Morning: We depart by motor coach for a full day excursion to Perthshire, with visits to Huntingtower Castle and Scone Palace, the original home of the Stone of Destiny and the site of the coronation of the Kings of Scotland. Lunch: Lunch is taken in Scone Palace. Morning: We depart early today by motor coach for a full day excursion to the Trossachs, some of the most beautiful scenery in Britain and home to Highland hero Rob Roy and stunning Loch Lomond. Lunch: Lunch will be taken in the tea room at the Queen Elizabeth Forest Park. Afternoon: We continue our day with a boat ride on serene Loch Katrine. Evening: A farewell meeting – time to say goodbye to your new found friends. Breakfast: In the hotel. Some participants may depart prior to breakfast. Morning: Transfer to Edinburgh Airport for onward flights. This concludes our program. If you are returning home, safe travels. If you are staying on independently, have a wonderful time. If you are transferring to another Road Scholar program, detailed instructions are included in your Information Packet for that program. We hope you enjoy Road Scholar learning adventures and look forward to having you on rewarding programs in the future. The hotel was once the London residence of the Vanderbilt family. Many original features have been carefully restored to their former glory including stained glass windows, wood panelled rooms and its magnificent artistic ceiling. Traditional Cotswolds hotel with honey coloured stone buit in 1870. Home to the "Pudding Club". The Best Western Premier Queen Hotel is well-connected and perfectly placed in Chester city centre. Five minutes from the Cathedral, you'll have the opportunity to escape the modern pace in our secluded Italian terrace gardens! Overlooking the famous 200 acre Stray parkland, the historic Grade II listed Cedar Court Hotel Harrogate dates back to 1671 and sits on the site of the town's first ever hotel. Today it is one of Harrogate's finest four star hotels, combining the building's grand original features with a stylish modern twist. This 4-star luxury hotel is on a quiet tree-lined street, 550 yards from Edinburgh Waverley Rail Station and Princes Street. It has a modern gym and a heated indoor pool. The en suite rooms have a flat-screen satellite TV, free Wi-Fi, and music. Some rooms look out towards the Firth of Forth, and many overlook the hotel's own beautiful gardens.